Unilever Australasia found a way to connect with Earth Hour this year with a print advertising for washing powders Omo (Australia) and Persil (New Zealand). 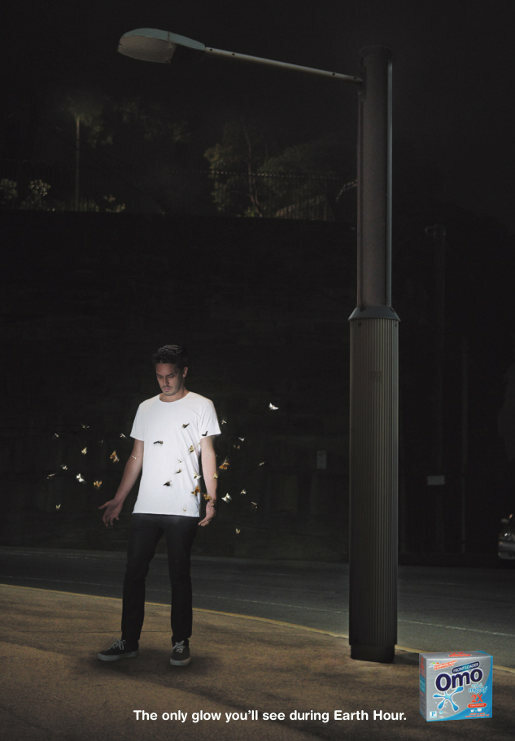 The topical advertisement features a man standing under a street light that has been turned off. His white t-shirt becomes the moth magnet of the night. “The only glow you’ll see during Earth Hour”. The Omo/Persil Earth Hour campaign was developed at Naked Communications, Sydney, by creative directors Sesh Moodley, Paul Swann, designer Kelly O’Rourke and photographer Chris Barlow (Christof Lowbar).